BOTOX® Cosmetic is a purified protein (neuromodulator) used to block nerve impulses that tell your facial muscles to contract. The result is that it creates a temporary relaxation of these muscles that cause wrinkles from frowning, raising your eyebrows, and squinting. Once it is injected, the muscles will be very limited in how much they can move. By reducing this movement, you can no longer make the facial expressions that cause the wrinkles to appear, and the skin becomes smoother. Botox and fillers are complementary procedures – but they are not the same thing and should not be thought of the same. Though they are both injections, they act quite differently. Botox is a neuromodulator which when injected in to target muscles Botox relaxes the lines that are created by the muscle movement such as the “11” in the frown area (forehead between the eyebrows). Treatment will last 3-4 months and with the right technique and skills, a patient can look more youthful without any of the usual telltale signs of a Botox treatment. Fillers are just that – they “fill in” the creases and wrinkles that are present at rest, such as the eye hollows, smile folds, and jowl lines. The majority of fillers are made of Hyaluronic Acid and can also be injected into the deeper dermal skin layer to restore lost volume and shape to the face. These thicker fillers are used to plump up depressed cheeks, temples and jowls. What is the Skin MD and Beyond Difference? With more than 1 million units of BOTOX COSMETIC units injected at Skin MD and Beyond, Drs. Wright have the expertise and long-term experience in Botox Facial Contouring – which means you will get the response you expect and won’t have to worry that your Botox could be improperly placed. The key to getting your natural look with Botox depends on the skill, technique, artistry and education of your doctor. With their well-deserved reputation of excellence, it is not surprising to know that Drs. Wright continue to receive annually, the ranking of Black Diamond Status with Allergan (makers of Botox) – An award given to only the top 1% of Allergan’s injectors nationwide. During your initial consultation, your doctor will take the time to explain your Botox procedure in detail so that you feel comfortable with the decisions you make about your treatment. They will listen carefully to your goals and concerns and work closely with you to create a customized treatment plan. Indeed, it is this individualized approach that enables you to achieve the natural, stunning results that Drs. Wright are known for throughout the Dallas-Fort Worth area. 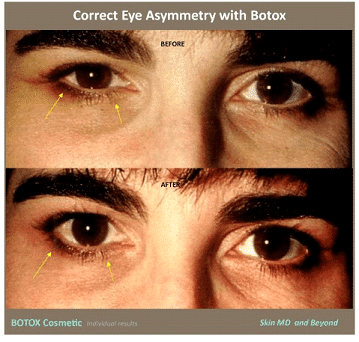 What is BOTOX COSMETIC commonly used for at Skin MD and Beyond in Plano, Texas? How is BOTOX Cosmetic used? A. A tiny amount of BOTOX® Cosmetic is injected into the muscle that creates the dynamic wrinkle. When BOTOX® Cosmetic is injected into a muscle, it blocks the nerve impulse from reaching the area, and as a result, the muscle relaxes. As the muscle relaxes, the dynamic wrinkle overlying the muscle is smoothed away. Will it give me a fake, frozen look? A. Not if you are treated by an experienced doctor, who will be able to determine the right dose and injection technique for you. The treatment only relaxes the muscles beneath the wrinkle line at the injection site, so the other elements of facial expression remain active. It also has no effect on sensory nerves, so you will have normal feeling in the treated areas. A. A tiny amount of BOTOX® Cosmetic is injected very precisely, into the muscle being treated. Because the needle is so fine and only a small amount of liquid is used, the pain associated with the injections is minimal. Most patients compare the sensation to a mild bug bite. No sedation or local anesyhetic is required, and you can resume normal activities immediately. How long does BOTOX Cosmetic treatment last? A. The effects of BOTOX® Cosmetic usually last three to four months, at which time another injection is required. After several treatments, the effects of BOTOX® Cosmetic may begin to last longer. A. The first step is to schedule a consultation appointment by contacting us here. Your consultation appointment will generally last about one hour. Dr. Wright will personally create your treatment plan with you in order to achieve the most efficient and effective results.